RT – March 19, 2018: The UK will either back up its claims of Moscow’s involvement in the poisoning of ex-double agent Sergei Skripal and his daughter, or it will have to apologize, the Kremlin spokesman has said. Foreign Secretary Boris Johnson said on Monday that Russia is wrong to deny responsibility for the nerve agent poisoning of Skripal. “The Russian denial is increasingly absurd,” Johnson told reporters in Brussels. “This is a classic Russian strategy… they’re not fooling anybody anymore,” he added. Peskov pulled no punches in fighting back, accusing the UK of “incomprehensible, unreasonable slander” against Moscow. “Sooner or later, it will have to account for these baseless allegations, either by backing them up with evidence or by offering its apologies,” the Russian president’s spokesman said. RT – April 14, 2018: The substance used on Sergei Skripal was an agent called BZ, according to Swiss state Spiez lab, the Russian foreign minister said. 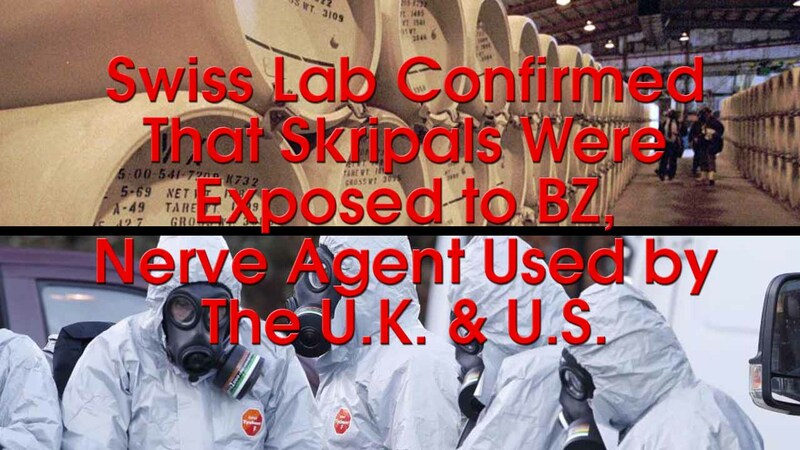 The toxin was never produced in Russia, but was in service in the US, UK, and other NATO states. BATTLEFORWORLD – April 6, 2018: The Skripal poisoning case in the end will stop at the same introduction line of slander and accusations. The rhetoric will continue indefinitely using the television script Russian word Novichok ad nauseum. The stupidity of it all for public drama and not anything displaying the real truth is to be expected from the lawyer-tongue ones. TASS – April 3, 2018: London will have to offer its apologies to Moscow but “the idiocy has gone too far,” Russian president’s press secretary Dmitry Peskov said on Tuesday. “London somehow will have to offer its apologies to the Russian side, but obviously it is going to be a long story and the idiocy of it has gone too far,” he told journalists commenting the situation over the notorious Skripal case. Peskov said he was sure the United Kingdom’s accusations would never be proved. “The British Foreign Secretary, who accused President Putin, and the British Prime Minister will have to look in the eyes of their EU colleagues after telling them what they told,” he added. RT – April 4, 2018: The Porton Down lab at the center of the Skripal poisoning case has a dark history of secret government-run human testing. The human trials were conducted as part of the UK’s war preparation against the Soviet Union. RT – April 3, 2018: Boris Johnson put his post in jeopardy after apparently lying about Russia being proven as the source of a nerve agent used in the Skripals’ poisoning. On Tuesday, the Porton Down lab said that they hadn’t identified the source. The Foreign Secretary’s statement, which is being widely shared on social media, features him telling Germany’s state broadcaster that scientists from the Porton Down laboratory were“categorical” about the Russian origin of the substance used in the alleged nerve attack. SPUTNIKNEWS – April 3, 2018: The chief of Britain’s military research center at Porton Down says experts are unable to identify the precise source of the nerve agent that was used in poisoning the former Russian agent, but that it was a military-grade nerve agent, Sky News reports. Gary Aitkenhead, chief executive of the Defence Science and Technology Laboratory (DSTL) at Porton Down, said they had not been able to prove A-234 substance, allegedly used for Skripals’ poisoning, was made in Russia, according to Sky News broadcaster. “There is no way anything like that could have come from us or left the four walls of our facility,” Aitkenhead noted. SPUTNIKNEWS – March 31, 2018: The Russian Ambassador to the United States, Anatoly Antonov, said on Sunday that the Skripal case was a pretext to carry out a provocation against Russia that has been in the planning stages for a long time. “The developments in the United Kingdom served just as a pretext to carry out a provocation against Russia that was planned a long time ago. We have closely monitored, who attended the US Embassy in Moscow recently, what kind of people [attended it],” Antonov said in an interview with Russia’s Channel Five. SPUTNIKNEWS – April 2, 2018: Commenting on the recent diplomatic standoff between some Western countries and Moscow over the Skripal case, Russian Foreign Minister Sergei Lavrov noted that the situation is even worse than during the Cold War. “When they say that the order came from the very top, then, firstly, President Putin personally commented on this situation and said that only a completely biased person, a person who started a terrible, insane provocation, can insist on that Russia had a motive. As it is done by our British colleagues. What was our motive? On the eve of presidential elections, on the eve of the World Cup in football? This is a cynical point of view to treat this problem,” the Foreign Minister told a press conference after his meeting with his Bangladeshi colleague. “How far we go, does not depend on us. In diplomacy there is a principle of reciprocity, nobody canceled it. This principle will be applied consistently… We do not want to play children’s games, as our partners are exactly doing,” said Lavrov. “The man was released, was pardoned in exchange for the representatives of Russia a few years ago. And if there were any claims on this person, he probably would not be subject to an exchange… I hope that Sergei Skripal will follow the example (of his daughter Yulia Skripal, who earlier came out of a coma), because, apparently, he and his daughter were roughly equally affected by the incident that took place,” he said. “Now our Western partners, I mean primarily the United Kingdom, the United States and several countries that have blindly followed them, have run out of niceties, resorting to open lies, to outright misinformation. We will respond to this fairly calmly, coolly, and insist that any accusations, any allegations must be justified by facts,” Sergei Lavrov said. “There are other explanations besides the ones our Western colleagues talk about, stating that only a Russian trace may be adopted as a final decision. (For example), experts say that it can be quite beneficial to the British intelligence services, which are known for their ability to act with a license to kill. This may be beneficial to the British government, which has clearly turned out to be in an uncomfortable situation, failing to fulfill the promises to its constituents about the conditions under which they will provide Brexit (Britain’s withdrawal from the EU),” he emphasized. “There are many questions, and the inability of our UK colleagues to answer them will mean only one thing — that this is all a fiction, and more specifically, a gross provocation,” Lavrov told the press conference. The Russian Ministry of Foreign Affairs is very interested on what basis France joined the Salisbury incident investigation, said Lavrov. “We have strictly distributed specific questions in full compliance with the Convention on the Prohibition of Chemical Weapons. The questions are addressed to the technical secretariat of the OPCW, and to our British colleagues and to our French colleagues because suddenly some reports have appeared and President Macron had said that France was actively involved in the investigation,” Sergei Lavrov noted. “Moscow analyzes each unfriendly step that is being taken against Russia, and each this unfriendly step is subsequently given a response, which is formulated accordingly. So let’s not get ahead of ourselves. Moscow will not leave unaddressed such steps,” Peskov told reporters. TASS – March 29, 2018: Moscow does not have any doubts the UK and the US took synchronized actions against Russia in the situation unfolding around the Skripal poisoning case, the Russian Foreign Ministry’s official spokesperson Maria Zakharova said on Thursday. “London and Washington are the beneficiaries of this provocation [the poisoning of the former Russian military intelligence officer and British spy Sergei Skripal and his daughter Yulia – TASS] and the expulsion of diplomats that followed it,” Zakharova said. SPUTNIKNEWS – March 31, 2018: It is difficult to speak directly about the involvement of the UK in the incident regarding the poisoning attack of Sergei and Yulia Skripal, but the concealment of information from London hints at the involvement of the British special services in this case, spokeswoman for the Russian Foreign Ministry Maria Zakharova said. “We haven’t had any information on this subject until now. The only official input that we’ve received from the UK came yesterday regarding the improvement of Yulia Skripal’s condition. Therefore, it is difficult to talk about the direct involvement of the UK and British officials in this story, but we have certain suspicions… concealing information and keeping quiet about the details of what happened makes one think that UK intelligence services may be involved,” Maria Zakharova said in an interview with Russia’s Channel 5. TASS – April 1, 2018: The United Kingdom cannot make secret information on the Skripal case and London will bear responsibility for this provocation, Russian Ambassador to the UK Alexander Yakovenko said in an interview with Itogi Nedeli (Weekly Results) program on NTV Television Channel on Sunday. “I believe that this time, like in the case with [Alexander] Litvinenko, like in the case with [Badri] Patarkatsishvili, [Boris] Berezovsky, [Alexander] Perepilichny, [Nikolai] Glushkov, efforts will fail to make this information secret. I am sure that Russia won’t let Britons out of the legal field and the Britons will have to bear responsibility,” the ambassador said. Russia is currently “choosing the methods” and determining which way to follow, Yakovenko said. According to the ambassador, there are “serious suspicions” that the provocation was staged by the British intelligence services. “They are refusing to cooperate with us and are not giving us any facts. These realities naturally prompt us to conclude that this is a provocation made by the special services,” the diplomat stressed. SPUTNIKNEWS – April 1, 2018: Russian Ambassador to the United Kingdom Alexander Yakovenko on Sunday said that the so-called Skripal case is a false flag operation conducted by the UK secret services. “This provocation has been carried out by UK secret services. We are not provided with any facts, they refuse to cooperate with us. Such a state of affairs brings us to the judgment that it is a provocation organized by secret services,” Yakovenko told the NTV broadcaster. The diplomat said that the provocation has been caused by two reasons, including the need to hide the fact that London had accepted almost all the conditions laid down by Brussels in the Brexit talks. The second reason is the intention to be a leader in the so-called deterrence of Russia and the need to gain the support of both parliament and people. RT – March 27, 2018: Russia must confess to the Salisbury ‘chemical attack’ in order to mend relations with the US and NATO, said the US State Department, adding that the only evidence the US needs for Moscow’s culpability was the word of its UK ally. “If Russia wants to improve relations, it needs to first acknowledge its responsibility for this attack and cease its recklessly aggressive behavior,” State Department spokeswoman Heather Nauert told reporters on Tuesday. “We certainly know that Russia is responsible for that attack. That is something that is not in question,” Nauert declared. Pressed for evidence, however, she said that the US stood by the word of its British allies. “When the UK tells us they have proof, that they know Russia was responsible, we have every reason to believe them,” Nauert said. RT – March 27, 2018: A document UK officials presented in a bid to persuade allies to expel Russian diplomats this week suggests London no longer questions whether Moscow poisoned Sergei Skripal, but offers no new specific evidence. Titled ‘Salisbury Incident,’ the six slide PowerPoint document was sent out to 80 top level foreign embassy officials in Moscow, according to Kommersant business daily, the news agency to which the document was leaked. The diplomatic effort was a bid to sway opinion and prepare the ground for the expulsions of over 100 Russian diplomats by more than 20 countries, which have been announced over the past three days. Previously, the UK publicly suggested that it was “highly likely” Moscow had a hand in the poisoning of double agent Skripal and his daughter, Yulia, on March 4 in Salisbury, however, the leaked document takes a harsher line. SPUTNIKNEWS – March 28, 2018: Earlier, the Russian Foreign Ministry stated that the chief executive of Porton Down Defence Science and Technology Laboratory had “amount to admitting” that the United Kingdom was developing combat poisoning substances. The behavior of the British authorities raises many questions. The UK population is itself kept in the dark about the key moments of this announced serious threat of the incident, the total number of victims is unknown,” the statements reads. The ministry has also accused the British lab in Porton Down of “hushing up information” in the wake of the poisoning of former spy Sergei Skripal. In addition to this, “throughout the world, London has been developing a campaign to create an absolute presumption of Russia’s guilt,” a statement on the website of the Russian ministry reads. “This is [UK Prime Minister] Theresa May’s fail. The largest manipulation of the world public opinion has been revealed, and British authorities are involved in it. Just assess it. The decisions on a state’s responsibility in a chemical attack were made on the basis of six pictures,” she wrote. SPUTNIKNEWS – March 25, 2018: The United States was developing the gas A-234, we have a document that confirms this, said the head of the laboratory for chemical and analytical control of the scientific center of the Russian Defense Ministry Igor Rybalchenko. “The fact is that back in 1998 when we looked through another version of the spectral library, which was published by the National Bureau of Standards of the United States (NBS), we found a substance there that we found interesting since it was an organophosphorus substance. And we realized that it must have a strong lethal effect. Now it turns out that, judging by the name of this substance, it was just the same nerve agent, A-234,” Igor Rybalchenko said. “The most interesting detail in this story is in the following versions of the database, which usually only expand, they are constantly replenished, more and more substances, we did not find this record. And I can’t explain where is it now,” the Russian military chemist said. “I affirm that it exactly corresponds to the formula published by Mirzayanov (Vil Mirzayanov, a Soviet chemist who moved to the USA and the author of the book on the A-234 gas). The chemical name of this substance is A-234 and was named “Novichok” by Boris Johnson, as a substance available in the Porton Down laboratory,” Rybalchenko said. SPUTNIKNEWS – March 27, 2018: The United Kingdom never provided the ambassadors of western states with any proof of Russia’s involvement in Sergei Skripal’s poisoning, the Russian Embassy to UK said in a Tuesday statement. The Russian Embassy to the United Kingdom of Great Britain and Northern Ireland issued an official statement saying that the UK never provided any proof of Russia’s involvement in Skripal’s poisoning to any Western countries’ ambassadors. SPUTNIKNEWS – March 27, 2018: The opposition Alternative for Germany (AfD) party criticized Chancellor Angela Merkel’s decision to expel Russian diplomats without obtaining firm proof of Russian involvement in the Skripal poisoning first. The opposition party rebuked Merkel’s government for its decision to expel Russian diplomats over Russia’s alleged involvement in the poisoning of Sergei Skripal and his daughter Yulia in Salisbury, England, earlier this month. The party said Germany should have secured firm proof of Russian involvement first and that groundless unfriendly actions towards Russia harm Germany. “Germany has nothing to win and much to lose if it lets itself be drawn into a new Cold War by rabble rousers and it willfully blocks diplomatic channels,” said Alexander Gauland, co-leader of the AfD, according to Reuters. “The claims made by the British government are unproven,” he said in a statement cited by Reuters. “Foreign Minister Heiko Maas has, in contrast to other EU states, shown no backbone towards British assumptions and has acted against German interests,” he added. SPUTNIKNEWS – March 24, 2018: Russia will once again demand the disclosure of information on the program of producing combat poisoning substances at the UK’s Porton Down laboratory, according to the Russian Embassy in the UK. It turns out, that Chief Executive Gary Aitkenhead has practically confirmed the laboratory is developing and studying new components of combat poisoning substances, a spokesman for the Russian Embassy in London said. “Indeed, we have noted that statement by the lab’s chief executive. This amounts to admitting that the secret facility is a place where new components of military-grade poisons are being researched and developed. Most notably, Mr. Aitkenhead did not deny the existence of chemical weapons stocks. Apparently, they include the A-234 agent that, according to official British statements, was used to poison the Skripals and Sgt Bailey.,” the spokesman said. SPUTNIKNEWS – March 24, 2018: A statement by Chief Executive of the British military laboratory Porton Down Gary Aitkenhead confirms that the facility is engaged in developing toxic chemicals, a spokesperson for the Russian embassy in London said on Saturday. “Furthermore, Aitkenhead did not deny there was a stockpile of chemical weapons, allegedly including the A-234 nerve agent, which in line with official assurances of the British side, had been used to poison the Skripals and Detective Sergeant Nick Bailey,” he added. The Russian embassy’s press secretary reminded that UK’s Foreign Secretary Boris Johnson hinted the UK had such samples. “These statements leave us no choice but to reinforce our demands that we should be given full information about the inquiry and that the program to produce military-grade agents in Porton Down should be made public,” the diplomat said. SPUTNIKNEWS – March 23, 2018: Russian Deputy Foreign Minister Sergei Ryabkov has said that Russia has never had a nerve agent called “Novichok,” saying that those who say otherwise do not have full information on the issue. “If, for some reason, the British called their chemical agent A-234 ‘Novichok’ — it is a question for them and for those Russian citizens who have lived in the West in recent years and decades,” Ryabkov pointed out. Ryabkov said that Russia had never had such a weapon and it had never been put in service in Russia. “For this reason it is absent from the list substances that are declared under the Chemical Weapons Convention: simply because it was not in service, not with us. Such developments, which could be considered the creation of a poisonous substance under the code-name “Novichok”, did not exist and does not exist,” the deputy minister stressed. RT – March 23, 2018: Boris Johnson has insisted that British chemical lab Porton Down told him the nerve agent used to attack the Skripals was definitely Novichok. However, court documents suggest there is no such certainty. A judgment from the High Court on Thursday, however, has allowed new blood samples to be taken from Sergei and Yulia Skripal and analyzed by the Organization for the Prohibition of Chemical Weapons (OPCW). SPUTNIKNEWS – March 21, 2018: The Russian Foreign Ministry and Russian Defense Ministry jointly delivered a statement after a meeting with foreign envoys amid the scandal surrounding the poisoning of ex-spy Sergei Skripal. “Russia owes nothing and can bear no responsibility for the actions or lack of actions on the British soil,” Ermakov added. Moscow surprised that UK authorities deny consular access to Skripal’s daughter in violation of international norms, Vladimir Ermakov stressed. Attack on Skripals is a “gross folly,” which is not beneficial to Russia, he stated. “Moscow’s list of questions for London regarding the Skripal case is growing,” Vladimir Ermakov added. “If the subject of the investigation has not been determined reliably, and all facts are being intentionally hidden, and real evidence may have already disappeared, which has happened in the United Kingdom many times, then it is not clear what issue the UK side has,” Ermakov told a briefing. “The West is ready to use any means it can to discredit Russia, incidents in Khan Sheikhoun show that”, Vladimir Ermakov said. “In conclusion I would like to stress that we are closely following the developments of the Skripal case… I am sure that in time the authors and the participants of this provocation will be punished… I would like to additionally stress that Russia does not accuse anyone of anything,” Ermakov told a briefing. “It seems that Britain is afraid to conduct an unbiased investigation” into the Skripal case, Russian Defense Ministry representative added. And the UK has presented no proof that the gas allegedly used to poison Skripal was made in Russia, he added. The United Kingdom first synthesized the VX nerve agent in 1962, according to the Russian Defense Ministry. The formula of the substance dubbed “Novichok” was published by scientist Mirzayanov, who is working for the US government, according to the Russian Defense Ministry. TASS – March 20, 2018: Moscow is sorry that the United Kingdom has opted to stoop so low as to vilify Russia instead of cooperating with it on the Skripal case, Russian Deputy Foreign Minister Sergei Ryabkov said on Tuesday. “If they really want to settle this tragic situation, they should get in contacts and cooperate with us on the bilateral basis or within the OPCW (Organization for the Prohibition of Chemical Weapons). Instead, they are only throwing mud at us. A great power that has stooped so low as to use such methods can only excite pity,” he said.